It's very important for a complex mechanical system to be properly maintained. Not just for longevity purposes, but also to ensure that there are no minor problems waiting to pop up. Ensuring safety is a key part of the maintenance service our team provides. Every modern garage door opener model comes equipped with special features that help guarantee it will reverse the door when faced with an obstacle. It's important that these features are tested every so often to verify that they are in fact working correctly. Our technicians will test the alignment of the photoelectric eye sensors and reposition them or replace them as necessary. We will also check the auto-reverse mechanism and adjust the force limit settings to ensure that it is able to sense resistance correctly. If you want to really reduce the amount of wear and tear your system suffers from, then having all of the relevant components lubricated is a great way to do that. Our experts will apply this treatment to every part that can benefit from it, from the rail of the chain drive opener to the torsion springs and even to the hinges and – if you have them – steel rollers. It's important to know what you're doing when applying this treatment, as some parts, like the tracks, don't need to be lubricated, and it can actually create a problem if they are. The maintenance service our technicians will carry out will make sure that everything from the spring tension to the shape of the panels is in top condition. This will help preserve not only the physical appearance of your door, but its functionality too. The right maintenance routine can add years to the lifespan of your system, and it is well worth investing it if you really want to get the most out of it. 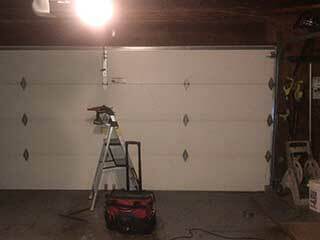 Contact us here at Garage Door Repair Lockhart to schedule a service appointment at your convenience.